Mr. Mister is an American pop rock band most popular in the 1980s. The band's name came from an inside joke about a Weather Report record called Mr. Gone where they referred to each other as "Mister This" or "Mister That", and eventually selected "Mr. Mister." 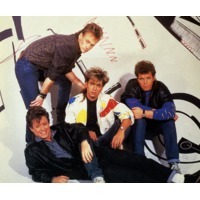 Mr. Mister may be considered as representative of the melodic sound of 1980s pop rock. The band consisted of Richard Page on vocals and bass guitar, Steve George on keyboards, Pat Mastelotto on acoustic and electronic drums and Steve Farris on guitars.